Create your own Apple-style badges—the possibilities are nearly endless. For example, you can use a Classic Badge to identify yourself as the author of a shortcut on your Shortcut’s RoutineHub page. You can also indicate that an app is required for your shortcut. And much more. With a Download Badge you have the possibility to link another shortcut which is needed to use yours. This could be e.g. update shortcuts like UpdateKit, Check For Updates or UpdateHub. 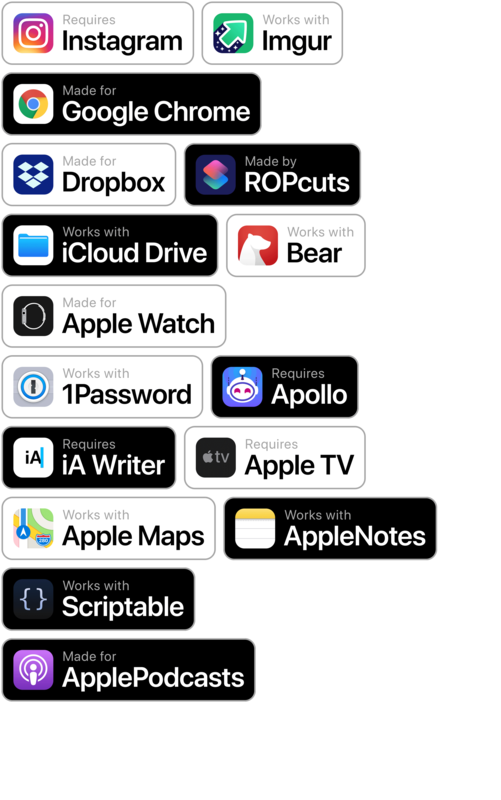 Classic Badges: Create your own badges in white or black, with a border or without, with the Shortcuts app icon, with an icon from your shortcuts, a custom icon or with an icon of any app from the App Store. All badges are available with a white and a black background. For custom icons there is also the option to select a border. In total there are ten different possibilities for Classic Badges. 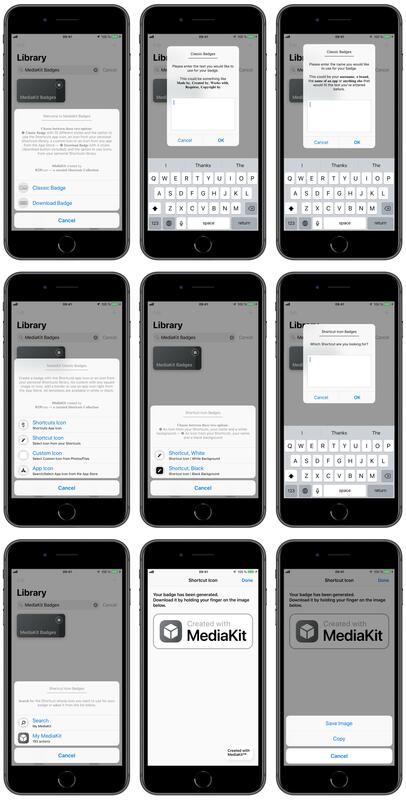 Download Badges: Create badges in white or black with a download button in white, black or in the colors of your shortcuts. All badges are available with a white and a black background. In total there are four different possibilities for Download Badges. 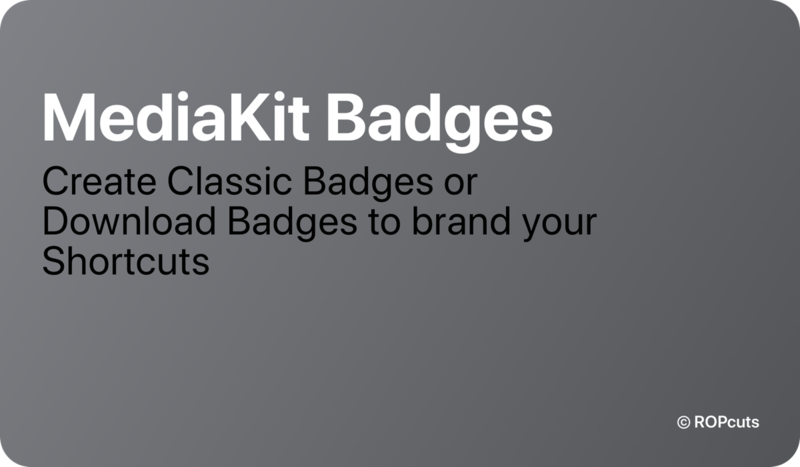 Important notes: MediaKit Badges has been tested intensively and over a longer period of time. Test devices were iPhone XS, iPhone X, iPhone 8 Plus, iPhone 7 and iPhone 6s Plus, iPad Pro 11, iPad 9.7, iPad Air 2, iPad Mini 4. All devices had the current iOS version and the current Shortcuts app version at the time of the test. 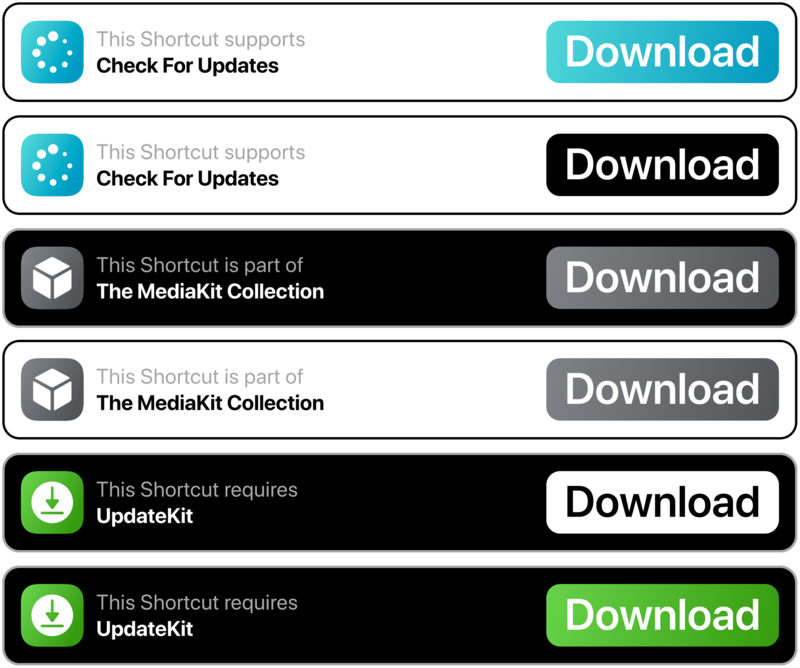 All in all, all MediaKit Shortcuts are stable. This also results from the feedback of the users. All graphics normally have a transparent background. 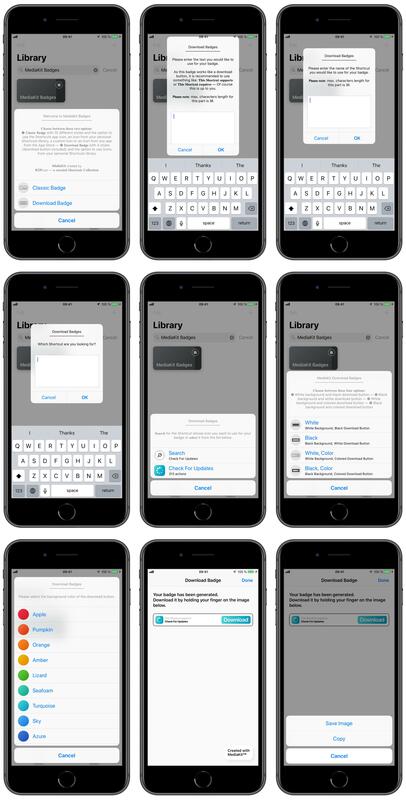 The tests have shown that iOS shows a strange behaviour: PNG files with a transparent background can lose it if the file is opened on another device, for example, using the iCloud Photo Library. Ideally, you should process the graphics directly with the device you used to create them. The graphics are also often displayed with a white background in the Photo Library. If you zoom in on the image, the white background disappears. The same phenomenon can also be observed with PNG files that are not created with MediaKit. All graphics created with MediaKit during the test period were imported into Adobe Photoshop and had a transparent background. If someone should have problems with the execution of the Shortcuts, I am glad about feedback, but I recommend to test expressly beforehand whether the problem is not solved, for example, if the Shortcut is executed again a few minutes/hours later. I myself created hundreds of banners, mockups and badges without any problems. Thank you very much. Special thanks: Special thanks to Adam Tow for adding a search function to MediaKit Badges 1.2. Awesome work! Thank you sooo much! Additional special thanks to u/matthewr_1987 from Reddit for his tremendous help! 1.2 - March 29, 2019, 9:21 p.m. I see one little bug in this. If we select a custom shortcuts app icon from our shortcuts library it doesn't show up in the final view. This can be fixed by replacing "show web page" with "Quick Look" but then you can't save the image.